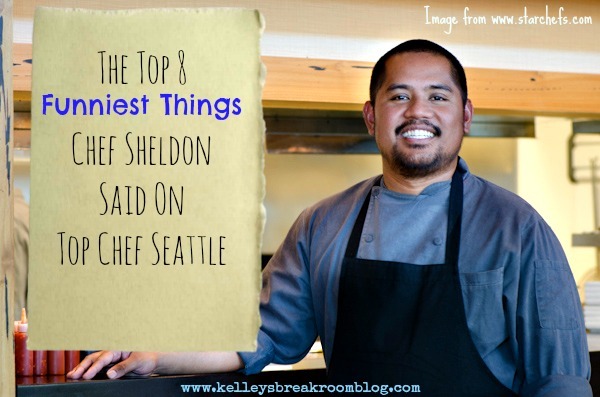 And the Top Chef mania continues… This weekend you will see more posts than usual on my blog centered around Top Chef. The show ends Wednesday. I’ve got a sort of marathon going on over here, except no one will be throwing water bottles at you and you aren’t allowed to throw water bottles at me. So disappointing, right? You can find all of my Top Chef posts here. In my professional life, I almost exclusively work with people with swallowing disorders. There are so many people that, for a variety of reasons, are unable to eat food and drink like they once did. Taking away food from someone is heartbreaking. All of social gatherings center around food. Why did I get all serious there for a minute? Okay, snapped out of it. It truly was a pleasure watching Sheldon on this show! He was such a fun, nice, kind, humble and talented guy. It made me laugh when I watched the part of the show on the first part of the season finale this week where his friend said that Sheldon was going to “put Hawaii on the map”. Hawaii is on the map and we all know it. I think the awesome food that Sheldon has made all season long has been highlighted plenty of times on this blog and elsewhere, but how about his funniest lines? He made me laugh out loud A LOT. For one thing, he said things that were unexpected. Everyone is walking around all serious about their purees and sautes and sashays and shuffle-ball-changes (went from food to dance there, folks, and I’m not sure why) and Sheldon is cracking jokes. #1: YAHTZEE: He threw something in the oven and yelled “Yahtzee”. Hee, hee. He was pretending the food was dice. I think that’s what he was doing. It made me laugh, anyway. #2: PUT DOWNS: When Brooke and Sheldon got in the car to go to Craft during the season finale after not seeing each other for a while, Brooke said, “Good to see you, Sheldon” to which he replied, “Wish I could say the same thing.” He was joking. Brooke knew it and she can take a joke. #3: “POURING ONE OUT”: While pouring something (was it olive oil? wine? vinegar? ), he said he was “pouring one out for my homies”. Now, I can just tell by looking at you that not all of you have much street cred. When homies lose someone, they show respect by pouring a 40 ounce on the ground. If you aren’t comfortable doing this with a 40 ounce, I’m sure a can of Diet Coke would work just as well. #4 TEAM HUSKY: While in Alaska, Sheldon saw some huskies. He said that he was now on a real “Team Huskies” being with those dogs. Before, he was just on Team Huskies with Josh. They called themselves husky because of their build. Husky. Husky. I’m not sure where I stand with that word. #6 AUSTIN POWERS: He did the whole pinky to the lip thing while in the governor’s house preparing dinner. I can’t remember the joke behind it now. (I will figure it out!) I just know he was pretending to be Dr. Evil while at the governor’s house. #7 FRIED CHICKEN: During the Season Finale, he called out to Brooke that her chicken was all ready to be made into fried chicken (or was it chicken fried steak?) whenever she was ready. Ha! That really made me laugh. It’s like saying she was going to make spaghetti for a fancy schmancy dinner at Craft. #8 TALKING FOOD: While searching for the food he was going to make during at Craft during part one of the finale, he said he wanted the food to talk to him. Funny enough, he shared that the spot prawns did and that they said, “Psssst! Pick me!” in a really high-pitched voice. I could make this list go on, but I got sidetracked thinking about a vacation to Hawaii to eat the menehune’s food. (That’s another funny comment. He called himself “menehune”. According to Wikipedia, the final source on everything, in Hawaiian mythology, “the Menehune [pronounced meh-neh-HOO-neh] are said to be a people, sometimes described as dwarfs in size, who live in the deep forests and hidden valleys of the Hawaiian Islands, far from the eyes of normal humans. Their favorite food is the maiʻa (banana), but they also like fish.” They were “superb craftspeople”. I am going to miss that menehune.